Pastor David L. Hansen: Can You Hear Me Now? The pastor shall speak publicly to the world in solidarity with the poor and oppressed, calling for justice and proclaiming God’s love for the world. Public witness. That is an important piece of what the church is called to be (A city on a hill, the salt of the earth), and also what we who work for the church are called to do. And yet, far too often, our witness has consisted of "Come join us for worship!" One reason that I advocate for clergy and other church leaders to get involved in social media is that it gives us a voice in the public square in a way that we have never had before. The Rev. Evan Dolive is a great example of this. Perhaps you have heard of Victoria's Secret's new line, aiming at ever younger girls? Chances are, you heard of it because of Pastor Dolive, a Disciples of Christ pastor in the Houston. He wrote an open letter to Victoria's Secret and published it on his blog, and to date it has been viewed 3.7 million times. I've had the opportunity to ask Evan a few questions about his experience. David Hansen: How long have you been blogging? Why did you start? Evan Dolive: I have been blogging for a little over a year now. I started when I began writing for a local paper. I wanted a place to host all of my writings. After a few posts, I began to write pieces just for the blog. My goal was twice a week and some weeks I did that and some weeks I didn’t. I wanted my blog to be a place where Christianity was seen as multifaceted and rich not bland and boring. When I was in seminary at Lexington Theological Seminary we were taught that we were not being trained just as ministers, but rather ‘public theologians.’ I use this mind set when I approach a topic or situation that I am blogging about. DH: Prior to this post, who was the primary audience of your blog? ED: My primary audience were Christians, non-Christians and those disenfranchised with the modern church. I wanted to provide a place where the public life seen in a different lens and Christianity was not viewed as a literalist, legalistic religion. I wanted people to know that a life lived for Christ didn’t have to look like the 700 Club. :-) The primary readership were my Facebook friends and Twitter followers. DH: What was your traffic like before? ED: Not all that great... a deemed a success a post that received more than 50 hits :-). The best post I had before this one was a reflection on the “Chick-fil-a Day back in August 2012- it received 2500 hits in two days. DH: At what point did you know that this was going viral? ED: I would say when I hit 60,000 page views in a day and then the next day I had 60,000 page views before 8 am. DH: Tell me about traditional media reaction. ED: I have been interviewed by four local Houston stations- CBS, Fox, NBC, CW. I have been interviewed by two national news organizations- CNN and HLN (Headline News). I know of about 20 print articles that talk about my post -- I would say that is a low ball number. DH: What advice would you offer to pastors about social media? ED: Don’t think it is waste of time. Social media is the ONLY reason why my letter went viral. I once had someone tell me that they didn't use social media because “they didn't care when I went to the bathroom.” (implying that only useless information is posted on social media outlets). While is true for some people, it not for the majority of people using social media. The world is changing and more and more people are using social media. It is a valuable resource for connecting people together. In the emergent and younger generations (the ones that every church says they want to target) the understanding of community is vastly different than the “Baby Boomer” and “Greatest” generations. In these particular generations, people will take spirituality and community where ever they can find it and that includes the internet. Social media is not going away it is only going to become more integrated into our lives like the new Facebook phone. Social media connects people from around the world and in the same congregation and therefore should be used effectively. Most of the commentary I have seen has been debating Evan's criticism of Victoria's Secret. 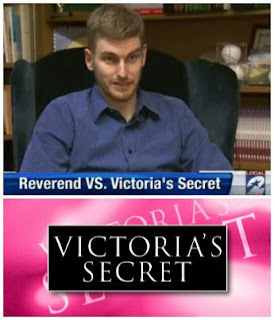 Is Victoria's Secret out of line, or is Pastor Dolive over-reacting? Such questions absolutely miss the most important point. With one post, Evan got us all talking. Church people. Non-church people. News commentators. Cultural commentators. All asking the same questions. Whether or not you agree with "An Open Letter to Victoria's Secret," it changed the conversation. Facebook is the new public square.Twitter is the new public square. With the click of a mouse, Evan Dolive changed the focus of the public conversation. He was not a celebrity blogger. He was not a nationally known theologian. He didn't be a full page ad in the local paper or a tv spot during the SuperBowl. Just a pastor, striving to be a public witness. Just a pastor, who one day clicked "publish" on his blog. And what about you? What about your church? Will we speak publicly to the world? Most popular posts . . .
Observations about . . .